The 2018 Canton Fair will be held from October 15 to October 19. 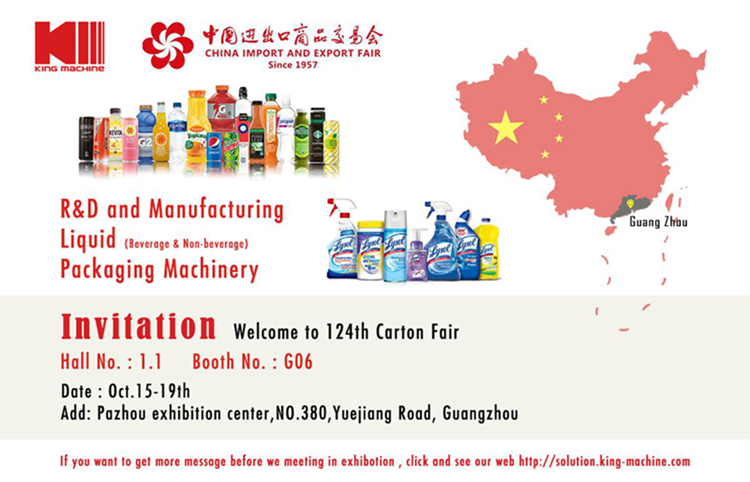 Zhangjiagang Kingmachine location of the Canton Fair will be Booth No. Hall 1.1 G06. Zhangjiagang Kingmachine welcome the old and new customers come and visit. King machine products:water treatment plant, bottle blowing machine, filling machine, 5 gallon water filling line, sleeve labeling machine, sticker labeling machine, shrink wrapping machine, conveyor system manufacturing,processing and marketing.